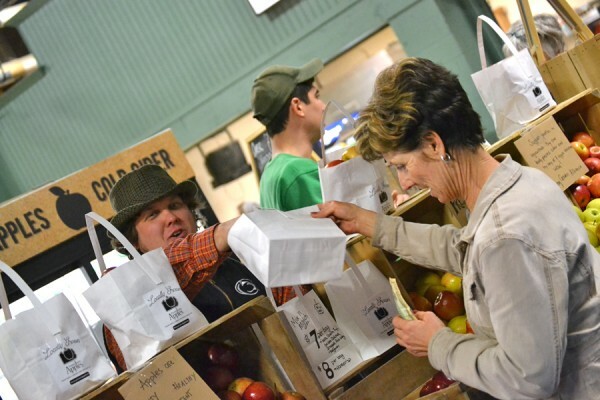 A local food sale is made at the Pennsylvania Farm Show. - Of course, the big news in local food is the Pennsylvania Farm Show in Harrisburg, which opens today and runs through next Saturday. Heading down? Here are some helpful tips. - As we are finally getting some cold weather, good time to remind everyone that there are several indoor farmers markets happening through the winter. These include the Boalsburg Farmers Market, State College Friday Farmers Market, and the Millheim Farmers Market. Please see the appropriate market’s link for more information. - Get some fresh air, exercise, and great local produce this summer by working at Healthy Harvest Farm. The farm is now interviewing for workshare positions for the upcoming season. Workshares work fou hours a week for 20 weeks in exchange for a summer/fall share. Details for the positions and how to apply are found here. - PASA’s 25th Annual Farming for the Future Conference will be held Feb. 3-6 at The Penn Stater Hotel and Conference Center. You can register at the Pre-Registration Rate if you do so by Jan. 25, otherwise you will need to pay the full fee at the event itself. For more information please see the PASA event page.